Whenever you find yourself unable to move forward, grow or change. Don’t look too far. In my journey so far I have come to see that for growth to happen, we have to grow internally. We have to become bigger on the inside before there can be any outward manifestation of growth. This may sound simple, but it is a very difficult process, that often means ‘death to self’, death to some things we treasure and painful ruthless shaking up of our comfort zones. I have a bible word for this process; it is called ‘consecration’. Most people wonder why they can’t move forward in their Christian life. They desire to grow and be stronger Christians, but just can’t move forward. One of the greatest lessons one can learn is that to grow in the Lord, you will need to consecrate more of your life, resources and time to the Lord. In Genesis 22, we read the story of Abraham and God. God instructed him to take his son Isaac up on a mountain and offer him up as a sacrifice. This in essence is the way of consecration. Abraham had believed God for this miracle child. He was born to himself and Sarah in their very old age. No doubt, they were so besotted with this young man. They loved him and I’m sure Abraham never let Isaac out of his sight. Then God comes along and instructs Abraham to go and offer Isaac as a burnt offering. The bible never records Abraham’s struggle with this request. We just read that he got up early in the morning and travelled three days to the top of Moriah. But I am sure this was not an easy process for even Abraham, the father of faith. But he obeyed nevertheless. On getting to the top of the mountain, (I must point out here, that consecration is a higher level, it a mountain top that often feels like a valley), he bound Isaac up and was about to offer him as a sacrifice, when God stopped him and then showed him His own provision. A ram caught in a thicket by his horns. Abraham accepted this exchange and offered up the ram instead of Isaac. It is very important to let you know what Abraham came to realise on top of that mountain. He got the revelation that God was going to provide his own perfect sacrifice. He saw that just like God asked for his miraculous son, so God will offer His only begotten son in exchange for man. He also understood the ram caught in a thicket by his horns. He saw that Jesus will carry the curses of man and die. He also saw that just like Isaac was spared and returned home with him, Abraham understood that God will raise Jesus from the dead and that His life would continue. He saw way beyond his time on that mount of consecration. He saw something profound. Consecration took Abraham higher. God saw that he was trustworthy, that Abraham loved Him more than anything else. So God swore by Himself, since there was nothing or no one greater by which he could swear. 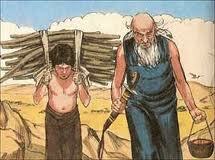 He told Him nothing would stop Him fulfilling His promises to Abraham. Are you struggling to grow in your walk with the Lord? What is He requesting of you? Is He asking for more of your time? Is He asking you to stop something you love doing? Trust me, whatever it is He is asking you to do or give up can never compare to what He has planned and laid up for you. Abraham had no idea God had made a great provision on the mountain. He got there and was given the picture of the future. He also received a cast iron promise. Take the route of consecration and go higher in your walk with God. Previous postTo Give is to Live and to Live is to Give!